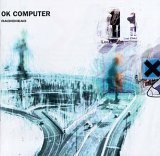 In the span of OK Computer's 55 minutes, Radiohead amazingly traverses and links musical styles from the '60s to the '90s. There are elements of The Beatles, The Byrds, U2, R.E.M., and the Smashing Pumpkins scattered throughout the disc, but these are combined with heavily sampled rave music and a huge dose of Pink Floyd to form a thick stew of sonic delights. U2's last disc Pop was good, but Radiohead outdoes the group by creating an album that envelops the sounds of the past decade with the history of rock 'n' roll. Indeed, there's a never-ending stream of discoveries to be found within OK Computer's swirling, spiraling, nearly out-of-control, yet calm and dream-like music. This stylistic approach — placid, but ominously chaotic — matches the lyrics and makes them all the more powerful. Pink Floyd's Dark Side of the Moon, Animals, and The Wall all seem to inspire this conceptual masterpiece, and OK Computer's dark lyrics make it a perfect second chapter to Pink Floyd's best-selling gem Dark Side of the Moon. At times it seems as if the story takes place somewhere in the future, yet at other times, the lyrics could ring just as true today. The human race is driving the world to hell in a hand basket, yet we're all driven to believe that we're fitter, happier, and more productive. One day, 25 years hence, the world will look back on this aural masterpiece much like it now looks back upon Dark Side of the Moon.